Almost two years ago my hot water system stopped producing hot water. I contacted Australian Hot Water and was very impressed with your service. You were helpful in accommodating my working hours and the technician turned up exactly when expected. At that time the system only needed a thermostat. The technician warned me that the system was "living on borrowed time". Last weekend the system started to leak. I didn't hesitate to contact your company again. Once again I thought your service was excellent. You phoned back after my message and made arrangements over the phone with a minimum of fuss. I appreciated the call to let me know the technician was on his way yesterday. The technician was a very nice person and the new tank was quickly installed. Thank you for your great service. Best of all I enjoyed a hot shower last night. 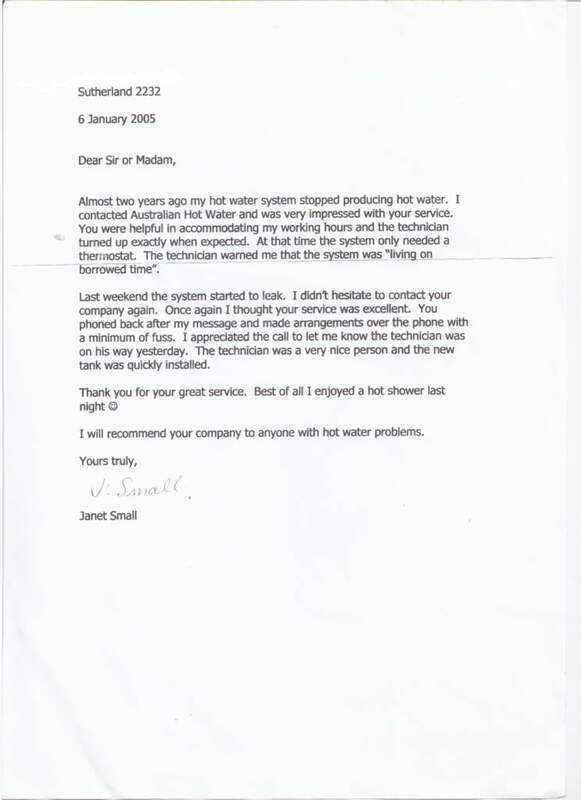 I will recommend your company to anyone with hot water problems.